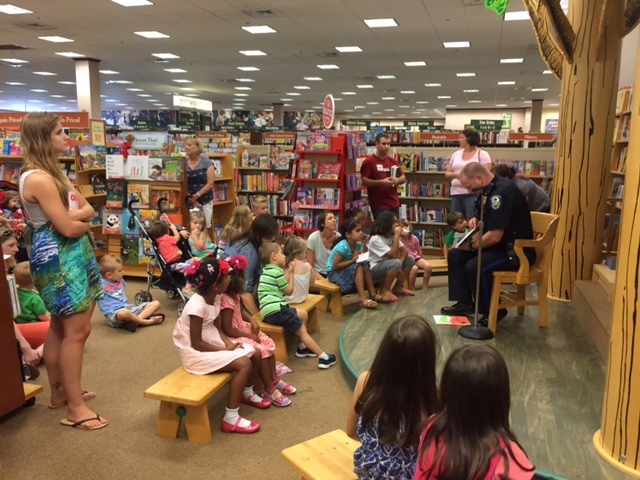 The Mount Pleasant Reading Patrol meets on the third Saturday of each month at Barnes and Noble for an hour of reading, followed by craft and giveaways. It is a free program geared to children ages 5 to 11 that builds a foundation of knowledge and trust for our youth and strengthens their relationship with the police department. Reading and literacy are key factors in school retention and graduation rates and the department believes that it is never too early to develop a lifelong love of reading. For more information, contact Sgt. Les Mauldin at lmauldin@tompsc.com or (843) 881-8242 or contact Youth Specialist Tia Egnor at tegnor@tompsc.com or (843) 849-2838, ext. 26664.